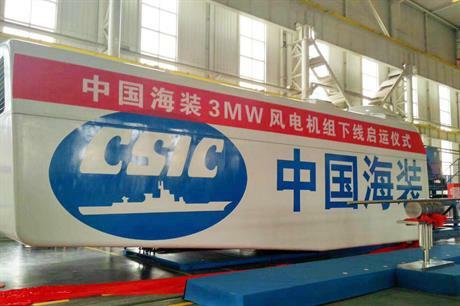 CHINA: China Shipbuilding Industry Corporation subsidiary HZ Windpower (CSIC-HZ) has revealed its first 3MW turbine. The new platform includes rotor diameters of between 136 and 146 metres and outputs of 3MW to 3.2MW, the company said. "It meets the various demands from customers. The modular design not only could reduce the investment cost effectively, but it also reduces the maintenance cost and improves power generation," the company said on social media. CSIC's current onshore product portfolio comprises a 2MW turbine with rotors ranging from 87 to 123 metres. It also offers a 5MW offshore wind turbine. CSIC-HZ was China's fifth largest turbine provider in 2016, according to the Chinese Wind Energy Association (CWEA). The firm installed 1,827MW last year, taking a 7.8% market share.